Poa andina Nutt. ; S. Wats. Bot. King's Exp. 388. 1871. Not Trin. 1836. Poa arida Vasey, Contr. U. S. Nat. Herb. 1: 270. 1893. 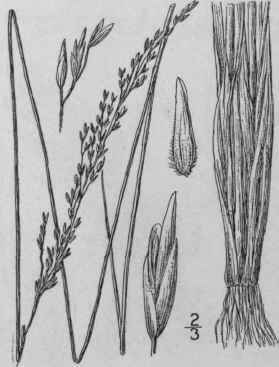 Poa pratericola Rydb. & Nash; Rydb. Mem. N. Y. Bot. Gard. Culms 1º -2 ºtall, erect, rigid, simple, smooth and glabrous. 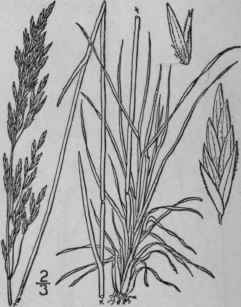 Sheaths usually overlapping, smooth or somewhat roughish; ligule 1"-2" long, acute; blades smooth beneath, rough above, 1/2"-1" wide, flat or folded, pungently pointed, those of the culm 1/2'-1' long, erect, the basal leaves 3'-6' long; panicle contracted, 2'-5' in length, the branches erect, spikelet-bearing nearly to the base, 1 1/2' long or less; spike-lets 4-7-flowered, 2 1/2"-3 1/2" long; lower scales nearly equal, acute, 3-nerved; flowering scales 1 1/2-2" long, erose-trun-cate at apex, strongly silky-pubescent on the nerves for half their length, the lower part very pubescent between the nerves; intermediate nerves very obscure. On prairies, Kansas to Utah, Wyoming, North Dakota and Manitoba. July-Sept.
Poa tenuifolia Buckley, Proc. Acad. Phila. 1862: 96. 1862. Not A. Rich. 1851. Poa Buckleyana Nash, Bull. Torr. Club 22: 465. 1895. Culms 6'-2° tall, erect, rigid, simple, smooth and glabrous. 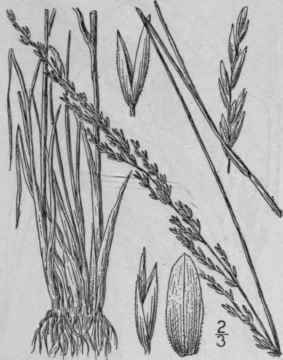 Sheaths shorter than the internodes; ligule 2"-3" long, acute; blades 1'-4' long, about 1" wide, erect, flat, or becoming involute, smooth or rough; panicle 1'- 4' in length, contracted, the branches erect, 1 1/2' long or less, spikelet-bearing nearly to the base; spikelets 2-5-flowered, 2"-3" long; scales acute, the lower nearly equal, scabrous on the keel; flowering scales about 2" long, obtuse or acutish, sparingly pubescent on the nerves below, sometimes slightly hispid toward the base between the nerves. South Dakota to Kansas, California and British Columbia. Bunch Red-top. Oregon Blue-grass. July-Aug.
Poa laevis Vasey, Contr. U. S. Nat. Herb. 1: 273. 1893. Not Barb. 1877. Poa laevigata Scribn. Bull. U. S. Dep. Agr. Agrost. 5: 31. 1897. Culms densely tufted, 1 1/2°-2 1/2° tall, erect, slender, the innovations 4'-8' long; sheaths smooth and glabrous; ligule 1 1/2"-2" long, glabrous; blades narrow and involute, 4' long or less; panicle slender, 3'-6' long, its larger branches l'-2' long; spikelets 2 1/2"-3 1/2" long, 3-4-flowered, the flowering scales 1 1/2"-2" long, hispidulous all over, obtuse to acutish. On dry hillsides and in meadows, Quebec to Washington, south in the mountains to Colorado. June-Aug.
P. confusa Rydb. Bull. Torr. Club 32: 607. 1906. Culms densely tufted, 1 1/2°-3° tall, erect, slender; sheaths smooth and glabrous; ligule 1/2"- 1" long, obtuse or acutish, hispidulous on the outside; blades up to 8' long, 1"-1 1/2" wide, flat or involute, puberulent; panicle narrow, 4'-6' long, its branches short and appressed; spikelets about 4" long, commonly 4-flowered, the empty scales shining, strigu-lose above, the flowering scales narrow, a little less than 2" long, obtuse or rounded at the apex, rounded on the back below, hispidulous. In open places and on hills, Nebraska and Montana to Colorado. June-Aug.